You’d think cooking might fall off the priority scale in a bare bones hut, at 11,400 feet above sea level, in the middle of winter. 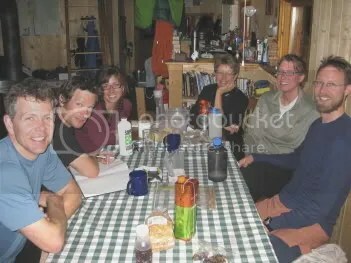 Actually, cooking, meals and food conversation were a good 50 percent of the fun on a recent altitude adventure. In fact, it was a deep discussion about the proper use of fresh cilantro that prompted this blog. First, however, some background. A friend and I accepted a challenge to ski seven miles with some outdoor pros to a backwoods hut in the mountains above Aspen, Colorado. While it was a cakewalk for them, my friend and I view the trip one of the crowning physical achievements of our entire lives. Things might have been easier, of course, if we hadn’t hauled in two pounds of hashed brown potatoes, one pound of cheese, 18 eggs and the fixings for a dried apple crisp. As mentioned, however, cooking was a big part of the trip, which is how we came to be discussing the proper use of fresh cilantro when the world outside was frozen solid. One of the dinner chefs was planning to make Thai Coconut Soup. To conserve space, he had mixed the fresh chopped cilantro with the peppers and onions, meaning the cilantro would have to be sautéed with the peppers and onions. Would this be a bad thing for his soup, he wondered? The standard answer is that fresh herbs should be cut as close to serving time as possible and added at the end of the cooking time, to prevent their flavor from cooking out (The Professional Chef, 7th ed., p. 183.) So technically, my hut companion did a “bad thing” for his soup by mushing the fresh cilantro with the vegetables that had to be sauteed. Although this answer was “right,” I’m not sure it was helpful. Assessing things as simply good or bad only seems to contribute to the cooking fear the paralyzes a lot of everyday cooks. “Am I doing this exactly right?” is a question that plagues us amidst on overload of cooking info in magazines, on TV and all over the Internet. Here’s an alternative view: Maybe cooking was never meant to be an exact science, subject to one-dimensional assessment on a good/bad scale. Instead, cooking is first and foremost an avenue for making food edible and then, pleasurable. The object is to simply do the best job possible, with the food gifted us, to make meals that nourish and nurture. Taking this perspective eliminates the pressure to achieve absolute “rightness” in the kitchen, replacing it with a no-pressure opportunity to just make things better, as we have the time and wherewithal. Hence the “Good to Better Cooking Continuum,” where the inquiry is longer judging good vs. bad, but exploring what might make a good thing better. The Thai Coconut Soup was a perfect example. It was magnificent! Could it have been better if the cilantro had been freshly chopped and sprinkled on at the end? Sure. But that’s just a trick for making it magnificent-plus on the next go round. Tomorrow’s post: A Thai Coconut Soup recipe, plus, in the vein of offering tasty tidbits for your treasure hunt, be sure to check out VegetableAMonth.com: all sorts of tools, information and inspiration you need to make your eating life better—especially when it comes to vegetables. Love your website and the yummy recipes ! I will be more prepared in the gourmet sense on my next hut to hut ! Another idea we’ve used while multi-day backpacking and tent-camping is powdered coconut milk (available at the Asian Market in Boulder). You can mix it with water, bouillon cubes, curry paste, freeze-dried vegetables and even a small amount of canned or pre-packaged meat if you’re so inclined. Voila – gourmet curry from very light ingredients! Cook some rice in the curry for a one-pot meal. 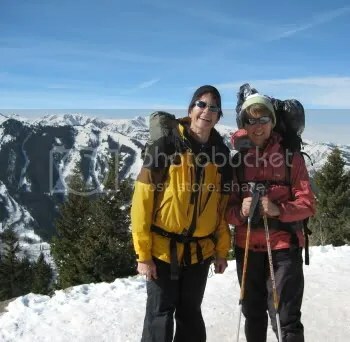 The drying option: A friend of mine freeze-dries her own homemade meals for backcountry adventures – it’s simple (home dehydrators are also pretty inexpensive) but does take some time and preparation. Something else to try: I am experimenting with drying meat jerky style. But on the first batch I didn’t cut the beef thinly enough or marinate it long enough, so I used it in chipped beef gravy over rice to see how it would taste re-hydrated. It was great. Jerry thought it was something real special! So I think that has some possibilities for getting some protein into backpacking meals. As for veggies, last fall I also dehydrated zucchini (because they are really easy to slice.) Added that to a Namaste gluten free Mexican pasta mix and was amazed at how good that tasted.